The plan generation screen can be found under the Admin/Execute menu. 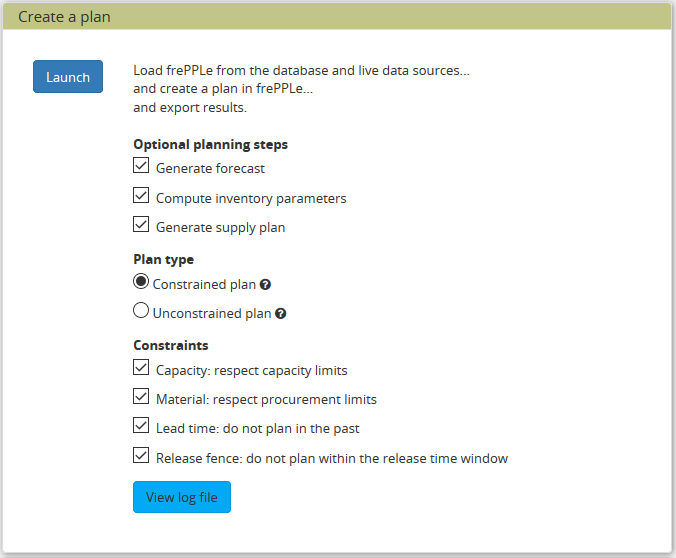 Optionally, on the Enterprise edition, the forecast and inventory planning modules can be run independently prior to the plan generation. The supply plan generation box has to be ticked to generate purchase orders. The forecast solver will calculate the forecast based on the historical demand for all (item, location, customer) intersections declared in the Forecast table. The inventory planning solver will compute a safety stock and a reorder quantity for all buffers declared in the inventory planning parameters table. The forecast calculated by the forecast solver is displayed in the forecast report and in the forecast editor. The reorder quantity and safety stock values calculated by the inventory planning solver can be found in the Inventory Planning screen under Inventory/Inventory Planning menu. The generated distribution orders (when applicable) can be found under the Inventory/Distribution Orders menu. The generated manufacturing orders (when applicable) can be found under the Manufacturing/Manufacturing Orders menu. The generated purchase orders (when applicable) can be found under the Purchasing/Purchase Orders menu. Note that all the generated orders (purchase, distribution and manufacturing) will have status equal to “proposed” as they still have to be approved by the planner to be sent to your ERP system.